Dispatches From A 'Dopesick' America - Dope Inc.
There’s no shortage of statistics about the depth of America’s opioid epidemic — there were 72,000 overdose deaths just last year — but numbers don’t tell the whole story. 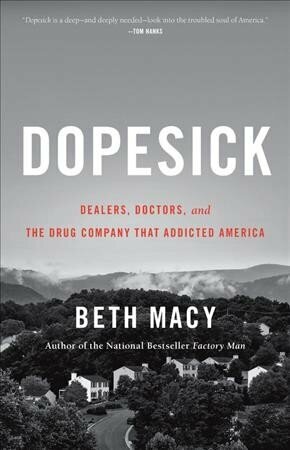 Beth Macy takes a ground-level look at the crisis in Dopesick, a new book focusing on central Appalachia. Macy has spent three decades reporting on the region, focusing on social and economic trends and how they affect ordinary people — she says this area is the birthplace of the modern opioid epidemic. Dopesick explores the lives of young heroin users and their long-suffering parents, and takes an intimate look at drug dealers and the cops, judges, doctors and health activists struggling to fight the epidemic. Macy also details the actions of executives of a pharmaceutical company that aggressively marketed opioids. Many users became addicted to drugs such as OxyContin when the medications were prescribed for pain, and moved to heroin when it became harder to get more pills. Macy says she herself grew up with a father who was addicted to alcohol, which made addiction a particularly difficult subject to tackle. This is an area where there … had been a lot of workplace injuries and the pill problem had been going on for quite some time. So Ronnie found a connection in Harlem and he started sending runners or mules up to New York on the Chinatown bus. The heroin was packaged in these hockey puck-shaped-like disks that fit inside a Pringles can. By the time the feds came after him … there were 84 people on a pyramid chart with his name at the top, him and another dealer. Some of the names at the bottom of the chart were crossed out because they had already overdosed. They were tree trimmers. They were high school wrestlers. They were young women who had grown up in foster care. They were people who had been addicted to pills and now they were addicted to heroin. Opioids for a whole century had only been used for very severe pain — end of life pain. [And the company’s goal] was to make it acceptable for moderate pain. … The more milligrams [sales representatives] talked doctors into prescribing, the bigger their bonus was — bonuses as high as $100,000 a quarter, just in bonuses alone. The parent company, Purdue Frederick, pled guilty to felony misbranding charges. The executives, they got it negotiated down … they would only plead guilty to a misdemeanor charge. All the parents [of people who overdosed on OxyContin] on the stand that day said they should go to jail. Even prosecutors in the office now — who are just deluged with heroin cases — say they should have gone to jail because, in a white collar crime, if nobody goes to jail the crime is just going to continue. … Of course OxyContin continued being sold, the same formulation for three more years. [Purdue] reformulated the drug in 2010. A lot of people believe that they only did it because their patent was about to expire. Opioid makers and distributors — they’ve spent almost a billion dollars on political lobbying and campaigns. They’ve continued deluging American communities with these drugs. I mean, if you look at Eric Eyre’s reporting, which won a Pulitzer last year out of Charleston, he writes about a tiny town — Kermit, West Va. — that has 400-some people. They were sending 9 million pills to that town. And how do they not know that those drugs were being widely diverted and abused? Most rehab centers in America do not offer medication assisted therapy. … Rehab centers historically came out of treating alcoholism and they are [Alcoholics Anonymous] and [Narcotics Anonymous]-based largely, which just isn’t as effective with opioid use disorder — effective in 10 or 11 percent — as opposed to medication assisted therapies, which have shown to prevent overdose deaths in 40 to 60 percent. That’s a tough thing to get better from. John Kelly at Harvard [University] says it takes the typical opioid use disorder patient eight years and five to six treatment attempts to achieve just one year of sobriety. We lost 72,000 people last year — up 10 percent from the year before. And every one of those 72,000 people and their family members and their friends, that’s a tragedy. This is an unprecedented level of a drug epidemic, and we really need a comprehensive model to mitigate it. … I think we just have to have leadership at the state, at the local, at the federal level of a big scale and intensity. Phyllis Myers and Mooj Zadie produced and edited this interview for broadcast. Molly Seavy-Nesper and Beth Novey adapted it for Shots.